In general, the higher your resting heart rate, the less physically fit you are, and the lower your heart rate, the more physically fit you are. (Some athletes have resting heart rates in the 40s.) One way to see if your new workout is succeeding is to check your resting heart rate over a few months. See if it has increased, decreased, or remained the same. 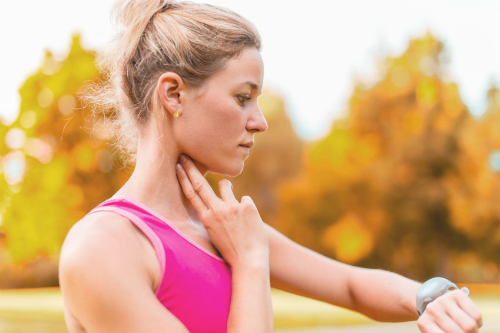 If your workouts are effective, your resting heart rate will slowly decrease, or at least remain constant. Your body has many ways of telling you when enough is enough, and if your resting heart rate has increased, you should start listening to your body by decreasing your workout frequency or intensity. Your resting heart rate is best measured when you first wake up in the morning, before your feet leave the sheets. Grab a stopwatch, or a clock or watch with a second hand, then find your pulse. You can locate your pulse either in your radial artery on your wrist or at your carotid artery in your neck. Choose the spot that works best for you. The only trick to measuring your heart rate is that you must use the correct fingers to do the measuring. Your thumb has a light pulse and can create some confusion when you are counting your beats. It’s best to use your index finger and middle finger together. After you find the beat, you need to count how many beats occur within 60 seconds. The shortcut to this method is to count the number of beats in 10 seconds, and then to multiply that number by 6. This method gives you a 60-second count. Example: You count 7 beats in 10 seconds: 7 x 6 = 42 beats per minute. If you have trouble finding your pulse or separating the beats in your body from the ticks of your watch, ask a friend for help. Have your friend count your pulse beats while you watch the clock or vice versa.